Canyon Color is both inspirational and educational. 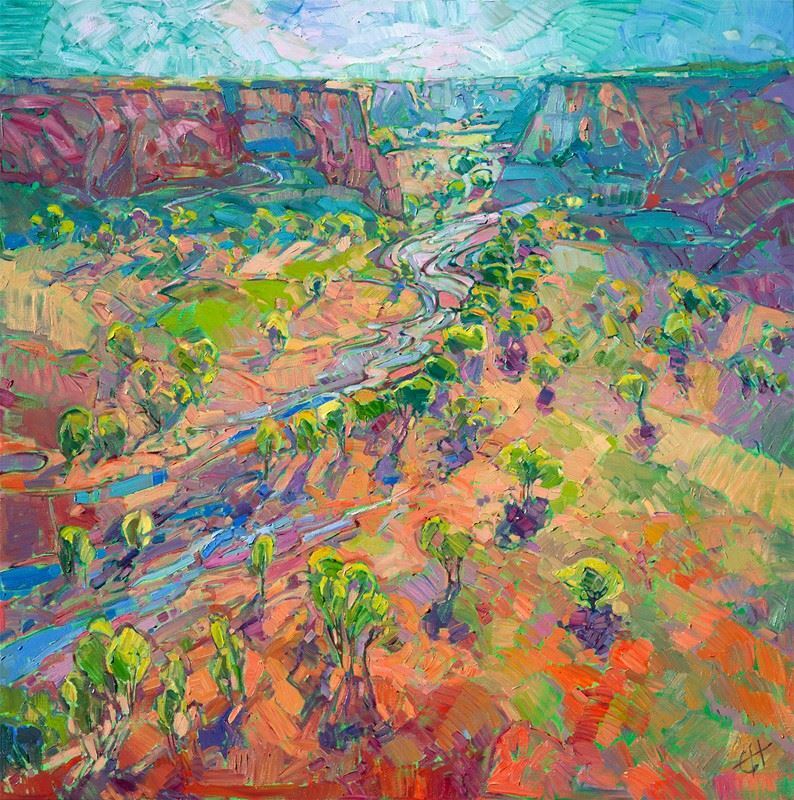 Supporting the National Park Service’s Centennial event in 2016, Canyon Color will be on display at the St. George Art Museum in Utah from January 15th to May 28th. While Canyon Color is available for purchase nonetheless, it won’t be available to ship until June 1st, 2016. Meanwhile, thousands of children (and their parents) will view the painting during its display period and learn about the preservation of our national parks. 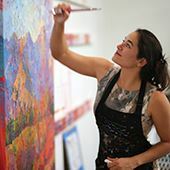 In fact, the artist is donating 10% of all painting sales from the St. George collection directly to Zion National Park. 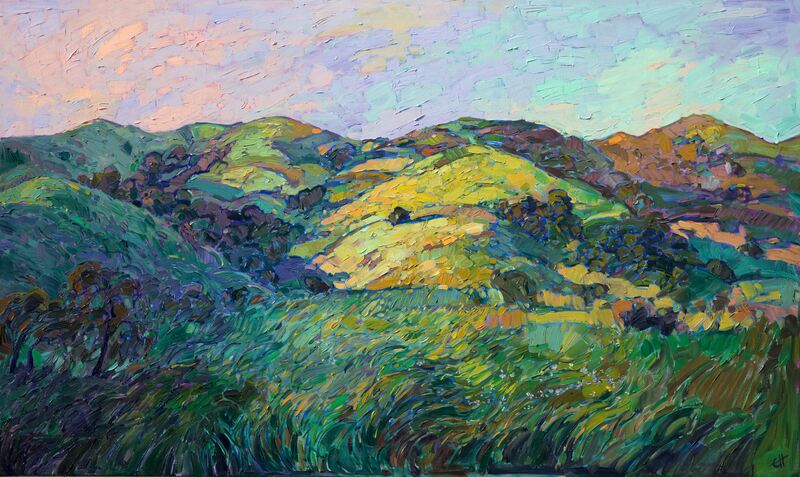 Created on gallery-depth canvas, this painting will be hung in a beautiful complimentary floater frame. Canyon de Chelly is bountiful with both color and history. 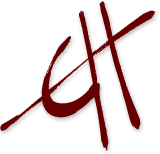 Translated literally, the Chelly part of the name comes from a Navajo word meaning, “inside the rock.” Pronunciation leans on an Americanized version of what was probably adapted from Spanish, but pronounced as if it were French. 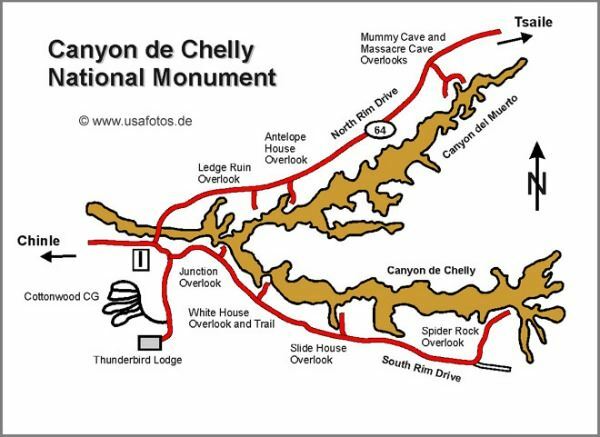 So to avoid confusion (and to look really smart to tourists who haven’t been there), here’s how you say Canyon de Chelly: kan-yuhn duh shey. Canyon de Chelly is unique. Owned by the Navajo Tribal Trust of the Navajo Nation, it is also a national monument. As such, it’s the only national monument to be jointly owned and operated by the National Park Service and an American Indian Nation. 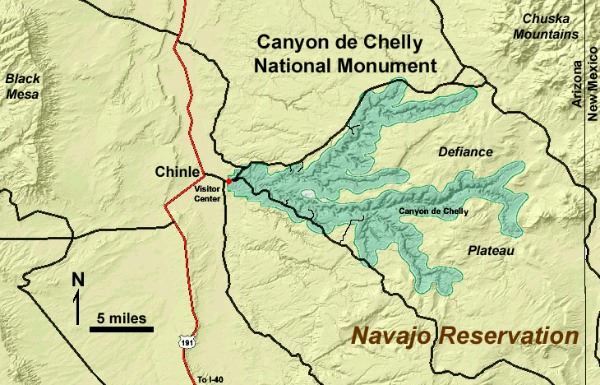 Canyon de Chelly is contained entirely within the Navajo Nation, in northeastern Arizona. The monument is one of the most visited national monuments in the U.S. and also one of the longest continuously inhabited locations in North America. Nearly 5,000 years of ancestral culture, in fact. 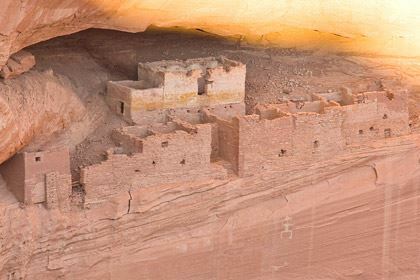 The evidence of this rather long history of tenancy is spread throughout Canyon de Chelly in the form of uninhabited ruins, canyon wall carvings and even bits of pottery from long ago. Since access to the canyon floor is only allowed in the company of an authorized Navajo guide or a park ranger, many tourists visit the monument by car and follow both the North Rim Drive and the South Rim Drive in a self guided tour overlooking the canyon. Canyon de Chelly is best visited from Chinle, the city just west of the Canyon de Chelly National Monument. From Chinle, travel east by car until you reach the Visitor Center. 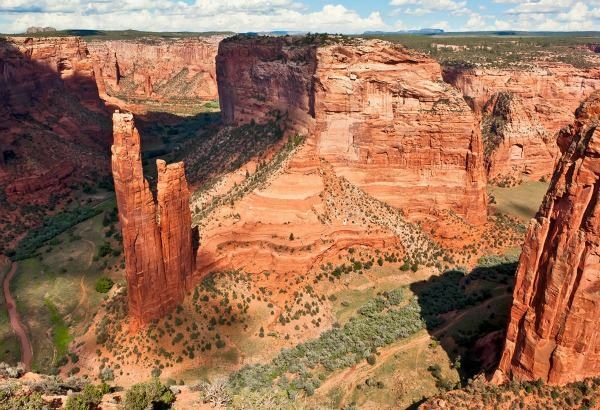 For a deeper understanding of Canyon de Chelly and the native culture so deeply embedded here, stop at the Visitor Center first to brush up on the history of the Canyon. The Visitor Center itself is a piece of history, an example of a traditional Navajo hogan. Here you can learn some history and get information on any programs and daily activities being provided to visitors. If you’re lucky, you’ll witness a Navajo silversmith demonstrating jewelry-making with Navajo designs. If you're short on time and don’t plan to do any hiking, the best choice may be to take South Rim Drive, which overlooks the Canyon de Chelly. There are a number of interest points and overlooks to stop and view, approximately a 2-3 hour jaunt. If you have 4-6 hours available, you may plan to visit both South and North Rim drives. The North Rim drive overlooks Canyon de Muerto. Both drives are about 15 miles long. The South Rim drive features the (unguided) White House ruins trail into the Canyon and the famous Spider Rock formations. The North Rim offers more of the historical points of interest, such as Mummy Cave, but no unguided hiking to the Canyon floor. Here’s a list of the more popular interest points along the South Rim drive, in order of appearance. Tunnel Overlook: Along with the nearby Tsegi Overlook, you’ll get a view of two short and narrow canyons that feed into the Chinle Wash.
Junction Overlook: Marking the junction of both Canyon del Muerto and Canyon de Chelly, it also features a view of First Ruin and Junction Ruin, from the Great Pueblo Period. White House Overlook: One of the largest ruins in Canyon de Chelly (80 rooms), this is your chance to visit the canyon floor without a guide or park ranger. Take the White House Ruins Trail 600 feet down and cross the Chinle Wash for a close look at the ruins. Bring water and take precautions for sun exposure. The round trip will take about 2-3 hours, even though it’s only about a 2.5 mile hike. Sliding House Overlook: So called because the ruins appear to be sliding off the narrow shelf upon which they sit, the overlook is 700 feet above the canyon floor with very sheer walls. Face Rock Overlook: At this point the canyon has deepened to a 1,000 foot drop. But it’s only the 2nd most spectacular view, and it’s just setting you up for the the next and final interest point. Spider Rock Overlook: Here Canyon de Chelly and Monument Canyon meet to provide a view considered by many to be the most spectacular of all. Aside from the panoramic view, there is also Spider Rock and Speaking Rock, two famous natural rock formations rising hundreds of feet from the canyon floor. Legend has it that Spider Rock is the home of Spider Woman, a deity of the Navajo. Speaking Rock tells Spider Rock about naughty children, so they can be punished. Their fate is too grisly to describe here, so let’s assume the children of Canyon de Chelly are extremely well behaved. Monument Canyon isn’t shown on the map at the beginning of this article, so to avoid confusion with the Monument Canyon in Colorado, let’s clarify that briefly. Canyon de Chelly continues east past the Spider Rock Overlook, but right around the overlook two smaller canyons split off from Canyon de Chelly and head south. The western canyon is Bat Canyon, and the eastern one is Monument Canyon. If you’re going to check out the North Rim self-guided tour, here are the most popular points of interest along that route. Ledge Ruin Overlook: Look for the handholds and toeholds carved into the sandstone cliff walls, which allowed Ancestral Puebloans to scale up the cliff walls. Antelope House Overlook: Historically speaking, this is a very interesting point of interest! 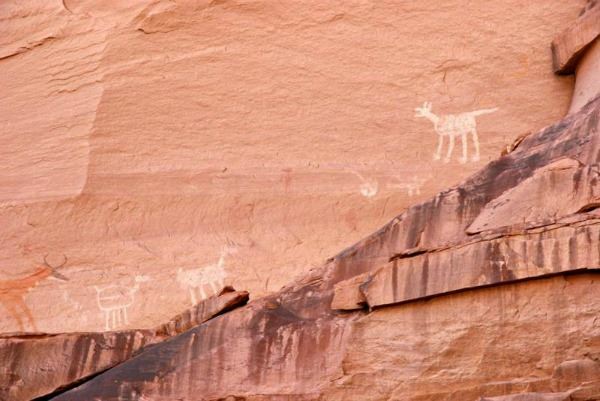 The antelope paintings adorning a nearby cliff wall date back to the 1830’s and give the overlook it’s name. The pit house below the Antelope House ruins dates as far back as A.D. 693. In the 1920’s archaeologists uncovered a tomb with a well-preserved body of an old man, complete with an eagle feather blanket and food provisions and skeins of cotton for use in the next life. The Navajo Fortress can also be seen from this point. Mummy Cave Overlook: Named after the two mummies found in urns under the ruins, which happen to boast of 1,000 years of inhabitants; possibly Ancestral Puebloans that came from New Mexico. Massacre Cave Overlook: In 1805 Spanish military massacred over 100 Navajos at this location, thus the name. A cave inhabited over 1,000 years ago, Yucca Cave, is also visible. Massacre Cave Overlook is the last point of interest on North Rim drive. While there are no fees to visit this national monument, private Navajo-owned companies do provide paid tours of the canyon floor. Depending on your tolerance level, your options are horseback, hiking on foot or 4-wheel drive. Feel free to bring a camera, but ask permission before taking a photo of a Navajo. Expect to tip at least $1 as a courtesy. There is a Holiday Inn and a Best Western on Indian Route 7, which leads into Chinle and the Canyon de Chelly National Monument. If you’d prefer to be as close to the canyon (without actually camping), check out the Sacred Canyon Lodge, which is less than a mile away and features a restaurant with Native American cuisine. The lodge is the only nearby lodging owned and run by the Navajo. Two campgrounds in the park require a fee and the sites are provided on a first-come, first serve basis. There are no showers or hookups at these sites but there are basic restrooms, a dump station, and a water filling station. If you’re set up in an RV, Cottonwood Camp is the best (and only) option. Paved streets and a pleasant grove of cottonwood trees at $14 per night - it’s still RV camping heaven. As always, plan ahead and be prepared when hiking or camping at any National Park or Monument, and know your limits. Some of the trails and tours can be strenuous. Canyon de Chelly has so much to offer; beauty, history and ancient culture still preserved carefully by the Navajo that live within the canyon walls. If you visit, you’re sure to enjoy every moment.